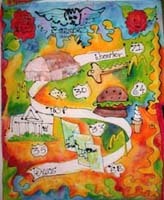 8-1-03 Turtle Trax Diary.Outsider Art quilts,paintings.Art Classes.Monthly Adult Art Class Workshops, airpen, fabric painting.Susan Shie.Turtle Moon Studios. Above is the little painting I made on fabric and sent to Gretchen and Mike, right before they found their perfect house and bought it! Topics in this diary: Camps from May, June, and July, 03; Montreal class; starting the garden; Quilt National '03 opening; Matt and Amber's wedding; quilt shows: Pushing the Surface and Sacred Threads; Gretchen and Mike's new house in Lakewood; Amber Lotus making cards and 2005 calendar from my Zodiac paintings. What a busy time this has been, these there months since my last diary, which went online on May 1. From May 2 to 8, we had a Turtle Art Camp here with Jacqui Fehl of Arden, NC, and Sharon Neuer of Stilwell, KS. 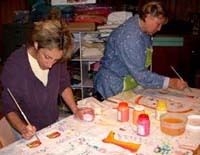 Here Jacqui and Sharon are both busiy painting with Deka Fabric Paint over their airpen drawings on fabric, after heat setting the airpen lines. The paintings would become the starts for whole cloth quilts later in the camp. I can't remember if we all really washed our hair at the same time, or if I just thought it would make a keen photo op to pose this way! But I had definitely taken a tiny break to wash my hair, probably while Jimmy was either taking over to teach airbrush or his machine free motion sewing that he does over my cursive handwriting. This group "fake quilt", put together by Sharon and Jacqui at the end of camp, includes everything we'd worked on all week. Included are our Lucky Samplers, paintings on fabric, paintings we'd sandwiched and had started to quilt, polymer clay experiments, shrink art pieces, etc. Sharon bought one of my Taurus paintings (right side, middle here, and bottom left), and I'll be putting the other one in my new "2003 Gallery" soon. I haven't started that gallery, but that's the part of this site that's gotten the least of my attention, so it'll be within a week, that it has at least two or three new things. Then I plan to add new paintings and quilts there as I get them made. I'm turning over a new leaf! I'd rather sell on there than go to eBay, really, so we'll see what happens! Here are a bunch of my new Sausage Baby beads, made from polymer clay during camp. I laid them out on the back of a quilt I'm working on, since it looks like peering down into a swimming pool. I arranged the Sausage Babies to look like they're those water ballet dancers from the very old movies, with the camera looking straight down on them. The red Sausage Baby in the middle is the star of the movie! I sent it to my friend Kate Kaufman in Santa Cruz, when her daughter Miranda requested a bead for a ceremony for her mom's Croning. She had Kate's friends, scattered around the country, each send one bead and a story about the bead and how it related to Kate. Kate was like our leader in Kent, among some friends in grad school. She was the oldest woman of several friends, and we all adored her. Still do. We're the Sausage Babies around her in the circle. Kate also turned me on to Fiesta Ware, back in 1981! She just now told me that she grew up in East Liverpool, Ohio, where both her grandfathers worked across the Ohio River at the Homer Luaghlin China factory, the only place in the world where Fiesta Ware is made. I love to go there! How's that for a good story!?? So then, after camp and quite pleased with myself for inventing Sausage Babies, I went up to Montreal to teach at Carole Segal's Studio of Fine Art. Carol had a class with around 10 students in it, which lasted four days. We did everything we teach here at camp at home, except for airbrush. I took my airpen and taught that, and it worked out well, since it travels so easily, being small. Above is the painting begun as an airpen drawing by Joan Stulginskas in the Montreal class. Her husband just loves to play golf, but she's not too thrilled with the sport. She and I laughed and laughed, as I worked closely with her, to get her going with that fussy little airpen. The golf club wouldn't fit where she wanted it to go, so I suggested that she could wrap it around like this, and she did. We both thought it was swell and quite pleasing! And her husband John also loves it! Yea! We used Setacolor Fabric Paints and other paints that Carole had in her lovely studio, which is very large and well lit, and it even has a little kitchen in back. On the first day of class, Carole brought in breakfast for us all. Very nice Montreal bagels, fresh from the wood ovens the city is famous for. She told me bagels were made in Montreal before they came to New York. Here are some of the Lucky Samplers made in the class. These students worked very hard and got a lot done, considering that everyone had to go home each night, or to a hotel. Some commuted and some came quite a long way. One student drove up from Upstate New York. Another was from Vancouver, British Columbia. Carole took us on adventures after class, including to a wonderful bead store owned by sweet and fiery Ruth one evening and to Ann Silverstone's amazing vintage textiles store another night. Inspiring us in the class were big paintings all over the walls, made by Carole herself, of floral arrangements and still lifes, in exquisitely realistic renderings. 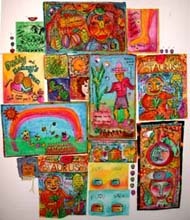 Carole's art is very eclectic, and she worked hard in my class, making art my way, too. I stayed at her home, filled with her beautiful artwork! Carole has workshops all through the nice-weather months, so if you're interested in checking out her roster, go see her site. Gina Gibson and Rima Omais hold up quilts made by Rima, during class show and tell. Gina is very English and Rima is Lebonese, just two wonderful examples of the cultural diversity in Quebec! Rima is starting a Lebonese Coffee Shop / Café in Montreal, where she'll soon be giving quilting classes as well, but first has several months of globe trotting to do, which is her usual style. Most of her family now lives in Ivory Coast, which is where she buys some of the exotic fabrics she uses in her work. One of my fondest memories of this class was when Line Rondeau told us a joke in French, having Rima translate it step by step into English. Everyone was busy sewing, and the light heartedness of this spontaneous happening perked us up through a mid-afternoon sleepiness attack! This is a painting I made in the Montreal class, using only a Rub-a-Dub marker and fabric paints. 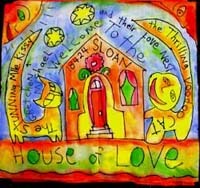 If I were going to quilt "House of Love", then I'd embroider over all the lines, like I used to always do. Now that I usually apply the lines with fabric paint and the airpen, I can choose whether or not to embroider over those much richer lines. I made this painting, because I had called Gretchen and Mike from Montreal and found out they'd finally found a house they both wanted to buy, after looking at about 25 houses in less than a month. They had seen the house about the time they got my painting of the House Whammy in the mail, after I left for Montreal. They were the first potential buyers to look at this house, but when they submitted their bid to buy, someone else submitted right after them. Two days later Mike and Gretchen had the house, and I had two more paintngs made, as part of my prayers and hoodoo contribution to the guaranteed sale! 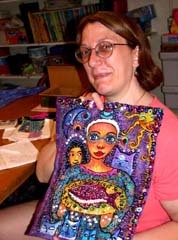 :) You'll see the other painting below later - the "House JuJu" piece that's now quilted. In "House of Love" above, the Voodoo Cat on the right here is a thing I named that way, after finding some silver fetish beads at Ruth's bead store, which Carole took us to. These particular cat fetishes seemed to me to have human faces. So that's pretty spooky, right? I decided they must be Voodoo cats, and the Voodoo cat here is Mike, and the Mlle. Kissy cat is Gretchen. I gave them the painting, when I got back from this trip and went to see the house with Jimmy, Gretchen, and Robin, who met Jimmy and me at the airport, so we could all work in the garden (Ha!) and go to Quilt National together. We left the airport, picked up Gretchen, met Kevin McGuire, the best realtor in the universe it seems, and went to see the house! Wow! Here, Gretchen! Have a painting! Have a Sausage Baby, while you're at it! Congratulations on the new house! More on the actual house later, as they moved into it in late June, and this was only mid May. Yes, I have real pictures of the house, besides my weird paintings of it! When the class was over at Carole Segal's studio, my former Turtle Art Camp student and dear friend, Ricki Moffat picked me up, and we spent a few days together at her mother's house. This is Ricki on the left, in the wild fuschia and lime hat, happy to be with her mother, since Ricki lives way out in Edmonton, Alberta! And Hilda Golick, Ricki's mom, is on the right, modelling the spiffy blue tam. We were at a great hat store called Haya Kova, where Rick tried on two thousand hats and bought a gorgeous tan one. I bought the blue tam, but I don't wear it in as classy a style as Hilda did! Hilda has Alzheimer's Disease, like my own mother had, and is still living in her own home of many, many years. It was heartbreaking to see her struggle to remain independent, and yet inspiring to observe her courage. Ricki and her two brothers and other family members are also undergoing the heartbreak and courage it takes to protect a parent from this disease. That each family seems to have to find the paths all over again, each time, is the saddest part. Luckily, this family is hooked up well to the Alzheimer's groups in Montreal, and they now have 24 hour in-home care for Hilda, who's on a waiting list to move into better care. Oh man, it's sad! She's a real class act, Hilda, as is Ms. Ricki, as well. They showed me some great sights in Montreal, on top of what Carole had already shown me. I really had a high old time in Mount Royal! My French is awful tho! This was either just before or just after Quilt National's opening weekend, which was during the Memorail Day weekend. Jimmy got some tilling done with our wonderful little Mantis tiller, Hennie Pogo, before we all gave up for a while. This Spring and even Summer were too cold and wet to get much done. And then, you go into the garden, and the Killer Mosquitoes attack you. Thank God for our perrenials, which have carried the gardens with their lovely colors, oh, and the re-seeded annuals! Hurray! I have tried to keep the Canada Thistles pulled, as Dad would approve! But they hide in the Borage, and when I wade in to yank them, I get Forget-Me-Not seeds stuck all over my clothes! They're such pretty plants tho, and they make a very nice ground cover, if you didn't get around to mulching this year...which we didn't! Look at us! We're at Quilt National at the Dairy Barn in Athens, Ohio! Aaaaaahhhhh! It's Luckele and Binele in Athens, Ohio again! The GREEN QUILTS team, on the loose, looking at all the quilts' statements, choosing the GQ award (which I'll write about later this month in the GQ update page...) We're also working hard at schmoozing with our friends that we only see at events like this. Hilary, Marvin, Maria, and company did a wonderful job with the show this year, and so did the jurors, Robert Shaw, Liz Axford, and Wendy Huhn. Oh, "Binele" is really Robin Schwalb, longtime Quilt National artist, who didn't enter this year, because her quilt wasn't done in time. Ratz! But I still bullied her into going to the opening, for GREEN QUILTS' sake, and after all, this way, she saw Gretchen and Mike's new house right after they won the bid! Yea! Nancy Erickson and I have written to each other for many, many years, but we'd never met in person. 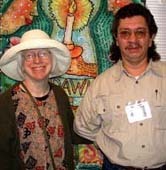 We'd shown our work in shows together, sent Christmas cards, and she was one of the artists I invited to show in the Dishtowel Quilt Show I curated in 1998-9. 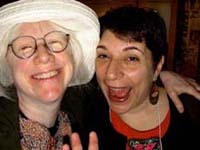 But this May at Quilt National, we finally met! She won Best of Show for her quilt in QN (shown here), and she, Jimmy, and I were all speakers at the Studio Art Quilt Associates meeting held in conjunction with the QN opening. I was so very happy to meet her. 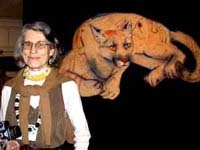 She's been a supporter of the GREEN QUILTS project from the start, since she and her husband, Ron, are both staunch advocates for protection of wild animals, like the grizzly bears of her native Montana area. This is the quilt we chose as our GREEN QUILTS award piece. I'll soon make my next GQ update page and put pix and a statement by Dinah Sargeant, the artist who made this quilt, "Link." Robin and I felt really good about awarding Dinah the 2003 GQ award, due to her statement, which was in sync with our GREEN QUILTS mission of environmental healing. As always, for the fifth time, we gave our ad-hoc award at the great pizza party at Hilary and Marvin Fletcher's home, after everyone ate their yummy meal. 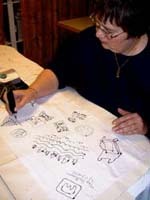 (Hilary is the director of Quilt National, held at The Dairy Barn in Athens, OH, every other year. The show tours for 2.5 years, once it's done in Athens, and Hilary and the other Dairy Barn Cultural Arts Center staffers are busy year round, managing all that this mega-show entails.) To make our little presentation, which had been kept a deep, dark secret... for hours... Robin and I stood on folding chairs and announced this unofficial QN award, like we always do. I'll have that online by September, I promise! Congrats, Dinah! 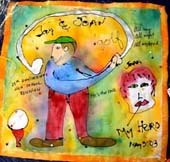 This is Jimmy and me, in front of our quilt "The Dish Soap / Hermit: Card #9 in The Kitchen Tarot", which is in Quilt National '03. I didn't stick a picture of it in full here, but I hope it's in the main gallery here on the site. Nope, I just checked! Last big quilt there is "Liberty Weeps for Her Country". Isn't that pitiful, that I haven't added new work? Well, that gallery is too long to add more to, so I'll be working on this problem. I know I want to start a new gallery of work made this year, but guess I should even do another one of major works before that. See why I try to make these diaries shorter??? OK, here's a picture of the quilt in QN now, then! 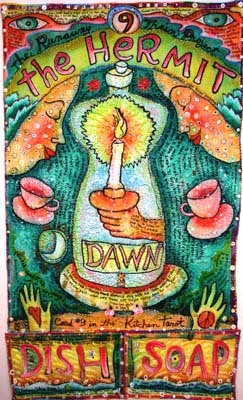 This is "The Dish Soap / Hermit: Card #9 in The Kitchen Tarot", our piece in Quilt National '03. It's 59"h x 34"w, finished just before the QN deadline in September, 2002. We began by sewing white feedsack-type dishtowels as the top layer of the quilt sandwich, and then laying a large section of a bride's dress train over the middle of the piece. All the lace panels, pearls, and sequins were originally on the train, tho I had to resew all of them! Next thing was to airbrush the drawing onto the piece, and to make the two bottom quilt sandwiched panels. Brush painting came after airbrushing all the colored areas. Then tons of hand quilting and beadwork, including hand embroidering over all the lines and the writing. All the writing is little diary vignettes about what was going on in our lives, as the quilt was being made. I got the idea for the dish soap bottle to represent the hermit card, since our dish soap bottle sits under the sink in the dark cupboard, and it's shaped like a little person. I loved working on this piece! It has the tiniest stitches on our work to that time, and now I would consider this an absolutely huge piece, even tho when we made it, I thought it was just middle sized! Working with smaller stitching and more detail means I enjoy working much, much smaller. I hope I have the energy to work on something this big again soon, but I kinda doubt it! Also we don't crave working on bridal trains or dishtowels any time again soon! We're quite happy with nice Kona or other not-tightly woven fabrics. Oh, the back of this quilt is all Lunn Fabrics' Krackle Crystal hand dyed cotton. I love that stuff!!! After Quilt National's big weekend of activities in Athens, we came back, worked a little in the garden with Robin, took her back to the airport, so she wouldn't miss her Homicide (tv show) convention thing in Baltimore, and got ready for our June 4 - 10 Turtle Art Camp. This was the wildest camp ever, in over nine years of doing this! Five friends in Dallas decided to all come to camp together, in one mini van! 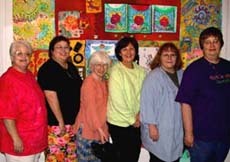 Sandy Brawner, who owns a large and wonderful quilt shop in Dallas called Quilt Country, and her four pals: Carol McLeroy, Carol Morrissey (shown here painting over her airpen drawing on fabric), Sara Tuttle, and Debbie Herring all came piling outta that van about 11:30 at night, on the travel-in day when students normally arrive between 5 and 5:30 pm! After two days on the road, their last stop had been Quilt National. Sandy called me from there at 5:30, when I thought they'd be getting here, and they still had supper to do and some wicked road construction to navigate. Whew! They did make it, and they were all in great spirits when they got here, in time for greetings and crawling into bed! This is Sandy Brawner, the group's fearless leader, doing her turn at trying out the airpen. She was making images of all the things that had occurred during the trip so far. She's concentrating hard, since you have to remember to hold the pen upright, or it'll leak paint into its little foam plug inside the black sheath, and then the paint won't flow. And you have to keep working steadily, so the needle doesn't clog , which would mean you'll have to change tips. Ugh! Sandy's watching that tip, trying to work fast enough to not have blobby lines, and slow enough to not have too skinny lines! Airpen is scary at first, but if you give it enough practice, it makes such lovely work. And the too thin lines and the blobby lines give the drawing more character, I say! We did everything in this camp that is normally done here, but MORE of it, with five students, the most we've ever had. We put Sandy and Sara into one room with two beds, to solve how to get five students into four camper bedrooms. Because these girls are such good friends, the studio and living spaces didn't seem any more crowded than usual. They just got along so well, helped each other so much, it was easy to have a bigger group! 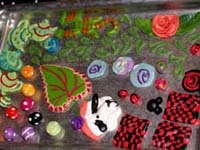 Above is our little toaster oven tray, filled with Cernit and a little Fimo polymer clay work. We packed it in, but it all fit, and everyone made something to go on the quilt they were working on. This is Debbie's painting with airpen lines and brush painted fabric paint colors, describing the wild adventure of driving to Wooster, Ohio from Dallas, Texas! It's a pretty large piece. We're still using up my Deka Permanent Fabric paint for both the lines and the colors, but soon I have to figure out what will be about as good for bright, luminous colors that are as rich as Deka. I'm experimenting slowly. I hate that they quit making Deka! Why on Earth?????? Anyhow, this trip to Ohio was quite the theme for the camp, as Carol McLeroy (Carol Mac) made an entire work apron odyssey about the trip, too, and I think there was at least one more. Sara did line drawings on paper about the Gang of Five (one of MY names for them, not theirs!) piling into and out of Sandy's van, too! Everyone kept very busy, and we all laughed a lot! Sara Tuttle works with Sandy at Quilt Country to illustrate the many original books and patterns they're making and selling. She's a very good and eclectic illustrator, who does as well with playful themes like this one, as she does with very fine realism. She made a huge realistic outdoor scenery painted mural for the front outside of Sandy's store. It's beautiful! 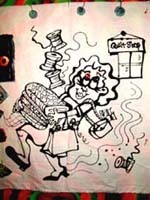 This drawing is Sara's first airpen piece: a typical shopper leaving the quilt shop during a big sale! 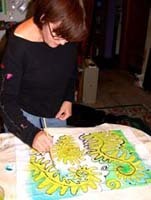 Sara's back home now, working on 96 4' x 8' wood panels, painting a whole town on them, to be someone's booth for the Houston Quilt Market and Festival. Yes, I said 96 panels! Everybody who knows Sara, tell her to get more sleep and finish what she can by the deadline. She can do more later! Yikes! I get really grumpy when I get sleep deprived! But won't that be a gorgeous backdrop for a booth? This is the lineup, y'all! 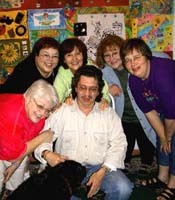 From left: Carol Mac, Deb, me, Carol Mo, Sara, and Sandy. This was after they'd put together the huge fake quilt of six people's work (including mine) from the five day class. The three rose panels above our heads in the middle is Deb's handbag project, in which she made three shaped pieces to be front, back, and flap of a bag. She started quilting one, and I think she decided to forget the handbag and make them into wall art. Deb was staying in our Rose Room (I had the April campers name their rooms after flowers, so now the names are official), and all her art that week included roses, and she was the Rose Queen! Somehow I messed up and didn't ever get around to taking pix of the whole fake quilt by itself, which is a real pity, since this one was pretty spectacular! But here are Sara and Carol Mac working hard to fine tune the piece. (Remember this is the final project of class, when we're all pretty slap happy and tired, but we have all this great stuff started! It all gets pinned up on the big work wall, as if it had to be all sewn together, and the group of students has to work together to decide on all the placements for optimal composition and construction considerations.) The other three students had been working hard on this piece, too, and by this time in the work, they were sitting back behind Sara and Carol, making suggestions and wise cracks. Yea! Sandy just sent me a picture she took of the full view of the Huge Fake Quilt made in this camp! Today is my birthday, Sept 28, and I'm so happy to go back and look at this August 1 diary, allowing me to really savor the good memories of all these fun adventures! My stove had broken in late April or early May, and I just couldn't believe it! I was pretty busy just then, and I couldn't decide whether to spend a fortune to save my 12 year old stove, with the lovely Euro style burners, or replace it. The appliance center said stoves only last 12 - 15 years now, so mine was being normal, dying at 12! But I still thought of it as my "new" stove, and had always thought it would last til I couldn't cook anymore! Its computer chip for all the oven functions had blown, but the burners and clock still worked. Ratz! We limped through the May camp without the oven, but knowing the big June camp was coming, I had to do something. So on June 1, we got a new stove, which I named June First. She was three days old when camp started, and I used the story of the Stove Handover to make this painting with airpen and brush paint, even a little airbrush overtones to brighten it up more, as class demos in our Dixie Chicks camp. Above is the piece as it was pinned into the fake quilt. 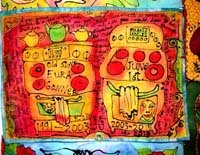 The stove painting, called "The Stove Handover" was already sandwiched, with a little bit of quilting on it. I still don't have it done, since I have too many other things going at once, but I want to finish it soon, so I can enter it in shows. I realized, as the delivery men were coming to take away my old stove, that I had never named her. She had those Euro burners, so I named her at the end ... "Eura Gonner." I really loved that stove, and they don't make Euro burners now. June First has a glass cooktop that's all white, pretty much. I was pretty afrraid of her at first, but have discovered she's kinda tough, and her flat surface makes a keen work counter in the kitchen, when you're not cooking! We're bonding. Here are our Dixie Chicks with Jimmy and Hattie, our dog, who doesn't show up in pictures very well! There sure was a lot of good energy that week! You Dallas Dolls are welcomed back here any time you want! And if you have me come down and teach at the store, I'll be thrilled to pieces! I'll even bring along some hot new Sausage Babies! I can't remember a finer camp here, and Jimmy feels the same way. And the bed is fixed now. Sorry about the bad bed! So then camp ended, and our wild five from Dallas left us high and dry, heading out to the highway in their magic bus! Jimmy and I really missed them instantly. It had been so lively around here, and fun! But now it was time to focus ahead to our nephew Matthew Ondrik and fiancee Amber Collins' wedding on Flag Day, June 14, four days after camp ended. I had a white pillowcase, so I made Matt and his bride a "Just Married" sign for the back of their car. This is a tradition I began when Gretchen and Michael got married in October, 2000. For my friend Pat's daughter Carrie's wedding I'd done two pillowcases, so they'd fit together on the bed later as a set. I only had one this time, so Matt and Amber would have to cope! I used airbrush for the whole thing, once again, and got the details I could from my sister Debi, Matt's mother. The big day came, and here are Jimmy, Mike, and Gretchen, using masking tape to seal the Just Married Pillowcase to the back window of the car. We realized that the drive to the reception would include a long haul on the freeway, so that fabric had to be taped down really well, or it'd blow off! Matt and Amber got married in Hubbard Valley Park, near Seville, Ohio. We'd never been there before, and after all the rainy weeks we'd had here in Ohio, it was a relief that our cloudy day didn't turn to real rain! The service was out on a little pier by a very pretty lake. A few ducks walked around, and about 50 people witnessed the wedding. It was very nice. Here are Amber, Matt, and Matt's parents, my sister Debi and her husband John. The service was very nicely done and is now over. This is the shot where the bride has just taken back her flowers from her bridesmaid, just after The Kiss, and it's time for the newlyweds to walk away! Before and after the service, the guests were cavorting in the park. Mike and Gretchen were enjoying the beautiful outdoors in this picture. You can't hold a Miller man still for very long! After the wedding, there was a frolicking reception at a hall in Barberton, where we got to eat a great meal and dance the night away. Matt and Amber went to Cape Cod on their honeymoon, and are now are buying a pretty house in Wadsworth, which they'll move into in September. Both Debi and I have one child, and both of them are married and have houses of their own now. The Grannies-to-Be Baby Watch is starting up! Yea! 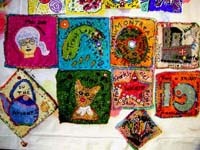 On June 20, my dear friend and art pal Rene Meier and I went down to Coshocton, Ohio, to the Johnson-Humrickhouse Museum, to see the third biennial "Pushing the Surface" art quilt invitational. 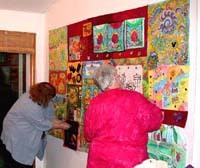 It has about 30 quilts by artists from around the US and other countries. 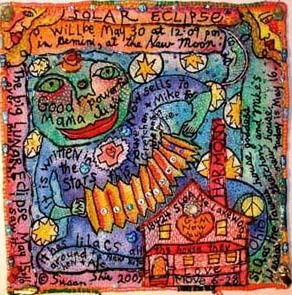 It's always a very good show, a real high water mark of what's happening in the quilt world. This year's show, running May 16 to September 7, has a theme of quilts inspired by Ohio, because of this being our bicentennial year. Here's Rene with Jimmy and my quilt "St. Q's Kitchen Shoes," which has writing all over it that's diary of our escapades in navigating the Ohio winter, cancelling plans and having make-up dates for things we couldn't do on terribly snowy days, which we had many of this year! I can't remember who made the beautiful bee piece to Rene's right, so if you know, email me, and I'll give the artist credit! On June 17, our April camp student, Sherry Boram, came up from Indianapolis to Wooster, to pick me up, since I don't drive, and took me with her to Columbus, to the opening of Sacred Threads, a show we both had work in. I hadn't realized ahead of time, that this was Sherry's very first art opening! I was so proud of her and glad to be with her! This is Sherry with her quilt in the show. A lot of the artists came to the opening, some from as far away as California. 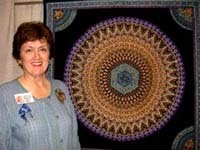 Some were already in town for QSDS (Quilt Surface Design Symposium), like Rita Scannell, who came from Ireland and had work in the show! The show was magnificant, with over two hundred quilts, all addressing themes of spirituality of one form or another. This is another biennial show, but is juried, rather than invitational. 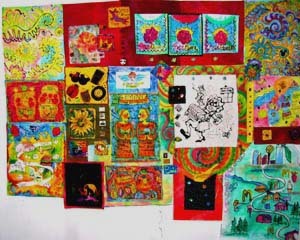 If you're interested in participating in the 2005 show, watch for Sacred Threads! It was very well handled! Sherry and I also dropped in on QSDS while we were in Columbus, to shop at the great vendor mall for art quilt supplies and peek in on the classes and say hi to friends there. We also visited Byzantium, the super bead store in downtown Columbus. It was a great day, but Sherry got very tired of too much driving in one day and spent the night at our house, before heading back to Indiana. She's very wonderful to do all that extra driving so I could go with her to our show! Jimmy and I also have work this Summer in several other Ohio art quilt shows besides "Quilt National" (up til Labor Day weekend, I think), "Pushing the Surface" (up til Sept. 7), and "Sacred Threads" (that one's overwith). Our other Ohio shows that are still on are: The Aullwood show "Birds, Flight, and the Wrights" in Dayton (June 1 - August 3); "Ohio Pioneers of the Art Quilt" at OSU in Columbus (June 15 - August 31); and a Food Quilts show at Ohio Wesleyan in Delaware (August 21 - Sept. 30). Oh, and we have a small quilt in Ohio Designer Craftsmen's "Best of 2003," which is now at the Southern Ohio Museum in Portsmouth (til Sept 29, and then it goes to The Dairy Barn in Athens. It opened in Columbus at the Ohio Craft Museum.) We also have quilts in other shows outside of Ohio, too, as usual. It's a busy year! See why I whine about my paperwork???? The painting depicts the couple and their three residences: a trailer in the desert in Arizona, a home in Pendleton, Indiana, and an Airstream in Virginia in a little group-owned Airstream park. 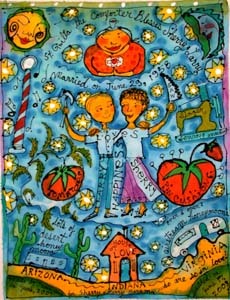 In my painting, St. Quilta blesses their very happy life, full of gardening, wood working, and sewing. Sherry started to quilt the painting as soon as she got home, and gave it to Larry, in progress, on their anniversary. I bet she's got it about done by now! She's a Whiz Bang! So the rest of June flew by, with me sorting file folders and paperwork heaps, working on art, etc, and Jimmy working full tilt to make his leather fly fishing cases. And then it was time for the July 2 - 8 Turtle Art Camp. Our students were Pamela Mattei of Louisville (and a senior in the Fine Arts dept. of Xavier University in Cincinnati) and Patty Hieb of Seattle, a returning student from last November's camp here. Barb Bruser of Covington, KY also came for a day, another returnee from the November camp. Above is Patty, working hard on a painting she was making about an Indian drink made with Mango and a secret ingredient, (rosewater. Shhhh. Secret!) Patty really didn't like doing airpen, and I think she started this piece with Rub-a-Dub marker, which I used to always use to draw my lines. Only, you have to embroider over those marker lines, since they're too weak to hold up visually, looking unfinished. But Patty is an unstoppable embroiderer, so she won't mind hand stitching all those lines. I'm enjoying the option to stitch the airpen lines or not! If I don't have to stitch them all, then I can work more on stitching the colored areas between the lines, in the same amount of time. You can always choose to stitch everything or part of the lines or none, with Airpen lines. Pamela turned 21 at camp! It was July 5, the day after the Fourth of July, so we got her some sparklers and a cake. They had postponed the Wooster fireworks on July 4, because it rained, and then they were going to have them on the night of Pam's birthday, but they postponed them again, even tho the sky was clear, and it was a lovely night. We found out later that on July 4, a tarp must have blown off of the supply of firecrackers, and they all got wet! So they couldn't shoot them off the next night. We're to have Wooster's fireworks now on August 17. I hope they can use the ones that were wet and not have to buy all new ones! I understand that firecrackers are very expensive anymore! Anyhow, aside from no fireworks, we all had a great time celebrating Pam's birthday! We like having students' birthdays as good excuses to celebrate here! Here's Barb, who was our one-day parttime student, being a smartypants, like she likes to be! She's holding up a quilt that Patty made from a painting of mine, and pretending that SHE quilted it, not Patty! This is typical of the dynamics of Barb and Patty, who kept us laughing all through their November camp, and who got right back into it now in July. I had given Patty and Barb each a painting to work on, as an experiment for a project I call "Lucky Partners." And Patty had gone wild on embroidery and beading on hers, getting it finished completely, putting the final touches of more sequins on it at this camp. Barb and I were both shocked at the amount of work Patty put into this piece, "Lucky Potluck - Trout". 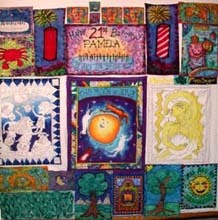 In the fake quilt made by Patty and Pamela at the end of their camp, you can see some of Pam's birthday and firecracker art, especially along the top here. Under her work is a row of three big paintings, all started that week by Patty, who came back to Turtle Moon mainly to use the airbrush, but really did a lot of hand painting. Bottom row is mostly Pam's work. My stuff is mostly top right here. For having really only two students, since Barb mainly brought her handwork from before, when she came for a day, this is a very big fake quilt! These two were both very productive, making lots of paintings to quilt later, and yet getting some sewing done! Oh, and of course, we got our Lucky Samplers made. I had stopped the Turtle Art Camp group tee shirt project last year, after many adventures in small edition airbrushed shirts. I have a stack of them, for sure. But I'd decided that the shirts kept us from working enough on other things. Still I hadn't created a replacement project, which would allow us to each have a souvenir of everyone's artwork from the class. So this time I cut out three pieces of fabric, and we took turns using a Rub-a-Dub marker at first, to draw images on the little rectangles. Since we started this probably on Sunday of camp, we had lots of mental images from our week's adventures already. After the drawings were heatset, we took turns again, painting the pieces. I had numbered them all at first, and we all chose numbers. So when it was your turn, just like with the tee shirts, you made your marks on your piece first, and then you did the same thing to each of the other pieces. The stacked up photo above shows our finished pieces, each just over 6"h x 8"w. We each own our little painting of shared memories and art from the class and can do anything with it we want. It can be quilted, framed, stuck up on the wall as is, etc. It can become part of a larger quilt or a panel on a garment or bag or pillow. 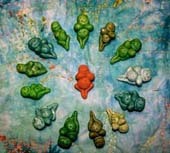 I like this project very much and guess it's now the Lucky Group Paintings project. I think this makes a lot more sense than doing airbrushed tee shirts, so they're a thing of the past. You can sew your painted panel onto a tee shirt now, if you want to! We may stick with Rub-a-Dub, since you get such nice, tiny lines with it. Or we may do this as an airpen thing in the future. It'll be up for votes in August's camp! This was Pamela, airbrushing her Cancer the Crab piece, as part of her birthday series of paintings. She wasn't thrilled to be photographed in the fashion statement respirator, but she's so pretty, she looks great in it anyhow. And this serves as my constant reminder to art students, that it's better to feel good than to look good! Wear your respirator whenever you've got fumes or particles to protect your lungs, brain, and body from! A live and healthy artist is a happy artist!!!! OK, here is "House JuJu", the quilt that I started up in Montreal in the class at Carole Segal's, when I knew that Gretchen and Mike were bidding on the house on Sloane! We had a huge full moon and full lunar eclipse that night, after they'd told me on the phone about finding the house and planning to bid on it. I could see the eclipse out my bedroom window, very clearly. It was amazing! I love eclipses! I had already made a little housebuying charm on paper, out of the notes I took about the house, from what the kids told me, and from the email they sent to me that night at Carole's house. But when I came to class the next day, I did this as my airpen and brush painting demo. St. Q is playing an accordion over the house, since she's in Quebec, where they love concertina music... or at least I imagine they do! Her face is the big moon, and she's a giant Lunar Eclipse, full of good vibrations for the purchase of this house they both wanted really badly! 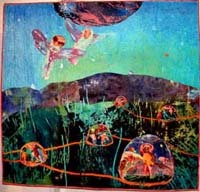 After working on this piece one day in class, Gretchen called Carole's studio and told me that they'd gotten the house. I told the class, "Hey, you guys! They got the house!" And everyone cheered, so that Gretchen could hear the reaction. She laughed about how everybody knows her and Mike's business, thanks to me. Or no thanks to me!!! Oh well, it's part of the deal! It took a long time to quilt this 12" x 12" piece, because now I'm making super tiny stitches! And I had some opaque Setacolor paint, not Deka, so my airpen lines got weakened, and I had to embroider every line anyhow! Coulda just used Rub-a-Dub! Ratz! Watering down opaque Setacolor is clearly NOT the answer to finding a substitute for Deka! "House JuJu" is going to be in "Wrapped in Cloth: The Human Figure in Textiles", a show at the Tubac Art Center in Arizona, curated by artist Thelma Smith. The show will be Oct 11 - Nov 16, 03. Gretchen and Mike closed on their new house on June 27 and moved that weekend from their apartment, also in Lakewood, across town to Sloane Avenue, near Rocky River. 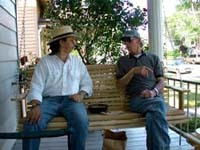 Here are Jimmy and Mike's dad, Bud, relaxing on the porch swing, after the move, solving all the porblems in life. The swing was a house warming present from Jimmy, who decided when he first saw the house, that this porch needed a swing. Mike and Gretchen have already stained and sealed it and its matching little tables. They're busy homeowners now! Sitting on this porch with Mike's family made me think of all the times in Cincinnati, at Gretchen and Mike's apartment on Ludlow, in the Roanoke apartment building, on the third floor, with the front-corner-of-the-building balcony. THIS new porch is safe and sturdy. That old one was... adventurous! The Roanoke was a lovely old Victorian structure, but it was past its prime! But still, nobody fell off of that balcony, and it never collapsed under our weight! We had a lot of fun sitting up there, watching people walk around Clifton on the Gaslight, three storeys below. But we're all thrilled that these two now have their own home, the first time it's not on a third floor in many years! They have a nice lot and garage for both cars. Trees and lilacs and many perennials, bunnies, chipmunks, birds. And a much quieter street than Ludlow or Lakewood's Clifton Blvd. Oh, Gretchen tells me there's a groundhog. Oh, man! Good luck! On July 12, Mike and Gretchen had us all up for their first family barbecue on their new Weber. 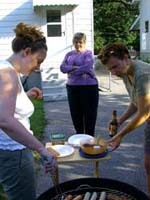 Here Gretchen and Kristi (who's FINALLY marrying Mike's brother Frank on August 9!!) work away at cooking, and Eileen, Mike's mom, and I give them unwanted and unneeded advice and just hang out, happy to let them do the cooking! Eileen and I have a big fantasy plot to buy a house across the street from Gretchen's house, preferrably a big old duplex. We'll keep both of our homes, of course. Hey, this is a fantasy, so why limit our dreams? We'll each have half of this cool place, and we can go there whenever we want to ... babysit the baby that isn't conceived yet??? Yeah, that's exactly our plan! There was a very nice white duplex for sale, catty-cornered from theirs, when Mike and Gretchen moved, but it sold. Oh well. We now have time to amass our fortunes for the big purchase of said Granny Pad! And if the Grandpas are good, they can stay there with us, sometimes! Mike and Gretchen had the most amazing real estate agent in the world, Kevin McGuire, who's sitting on the front steps with them here. 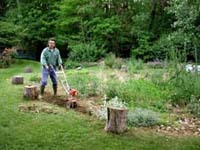 It was just after the big move, and he stopped over with a chain saw, to cut up some big railroad ties behind the garage, to make them small enough to put out with the trash. Kevin even had them buy a storm door for the back of the house, since one was missing, and then he went and picked the door up in his truck and brought it to the house, and built the jamb for it and installed the door! I'm telling you: if you live near Cleveland, get Kevin to find you a house! He told Mike and Gretchen that he tries to make sure all his buyers get some help from him in getting their new homes into shape! What a house! How happy I am for Mike and Gretchen, who are very busy doing things to make their new place totally nice. Their friend Matt Hawk, an electrician, has helped a lot, working with Mike to get things up to snuff. They're ready to paint the dining room, where Mike's got his piano in his own house finally, after years of storage at his brother Brian's house. They'll make it about the color of this page, which I think is what they painted the dining room of their apartment they just moved from. And the living room is going to be sage green. My Gretchen and Mike have their own nest now, and we're all so happy. Their house will be the spot for the cake and champagne party after Frank and Kristi's wedding, so we'll be back there soon! I'll have pix from that next family celebration in my November 1 diary here, so come back! Just thought you might like to see this House Whammy painting a little larger than it was at the very top of this diary. I love working with my airpen and then fabric painting. I love that Gretchen and Mike really did find the house they both love, right when they got this! I love making up hoodoo charms of my own! Cards and calendar! This won't happen for a while, in terms of people being able to buy them retail, but cards and a 2005 calendar are going to be made by a very nice company called Amber Lotus, using images of my Zodiac Paintings, which I made after my mother died, to help me grieve for her and celebrate her life. 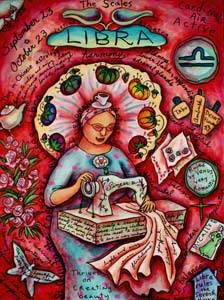 I'm hoping they like my working title, "A Household Zodiac; Astrology with St. Quilta the Comforter." If you own a store or website, where you think you'd like to sell the cards or calendar, please contact Amber Lotus now. They don't know anything about the quilt world, since they're into spiritual themes. I'm the first cross-over artist for them, doing my astrology and art quilts. They're planning on doing a very small, one time printing of 3 - 5, 000 of my calendars, but I hope small businesses in the quilt world will order calendars, so they'll do a larger printing. They base the number of calendars they make of one title on their pre-printing orders. They also told me they only print 2,000 of each card, and then will reprint when 10 of the 12 cards are out of stock. So it will help if you pre-order them, too. I think I can sell 2,000 of each card myself! Well, maybe! These would be available next year, not now. But if you want to tell them NOW that you will order some cards and calendars wholesale, this is the time to do it, to get the production numbers up. And if yu don't own a store or site to sell things, but you have a store or site to suggest the cards and calendars to, please send them to see the paintings on my site, and tell them about Amber Lotus. Amber Lotus tells me that they DO sell retail from their site, but you have to spend at least $50. Well, that's a couple of calendars and sets of cards, so go do it, when I give you the high sign, when they're ready to buy next year!!!! I've just now put very improved images of the paintings in the gallery, so if you saw them before today, go back and look again. It's like day and night! Now they really sing out in their true colors and are much more clear. I'm really excited about this project with Amber Lotus!!! That's all folks! See you again Nov. 1.